Pamper your skin with the goodness of aloevera, almond and fruits with CosmoHerbal’s varied range of moisturizing lotions that will leave your skin look super supple, shiny and healthy. Soothing to skins of all types, the advanced formulation also helps in keeping the harmful UV rays and pollution at bay. Enriched with real extracts of almond and honey, the lotion works on an advanced moisture lock therapy that helps in restoring the elasticity of dry skin. Its active skin care formulation maintains the oil balance in the pores, which thereby is very much required to keep the skin supple and smooth. Besides, it also keeps the skin unaffected from harsh pollution, wind and sun. Honey is an excellent alternative to retain the moisture content in the skin. Its unique characteristic of being naturally anti-bacterial also helps in giving the skin a great complexion boost, besides combating dryness. Highly recommended for sensitive skin, Almond oil is a major source of vitamin A and E that prevent acnes and impart a radiating glow. 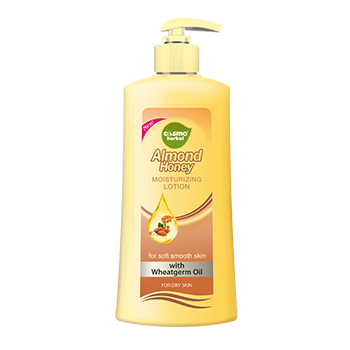 Almond oil being naturally rich in anti-oxidants also helps in reducing wrinkles and fine lines on the skin. Experience the goodness and freshness of real aloevera extracts with Cosmo’s moisturizing lotion that penetrates deep under the skin and rejuvenates it from inside. Its advanced hydration therapy repairs damaged skin cells and tissues and helps in getting back its natural sheen. 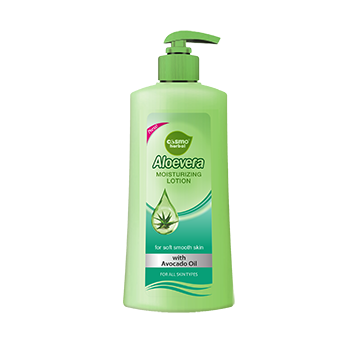 Miracle plant Aloevera acts as a perfect natural skin moisturizer in all kinds of weather. It is known to hydrate the skin from inside without giving the skin any greasy effect. Can also be used to treat skin burn and inflammation. The fruit and flower moisturizing lotion by CosmoHerbal is a perfect fruit massager for that extra deep care of your skin. Enriched with the real essence of fruit, flower and the amazing combination of jojoba and grapeseed oil, it locks the moisture within, keeping the skin smooth and supple for long hours. Fruits play an essential role in maintaining a sound health and so, are very much required for a healthy glowing and smooth skin. Enriched with vitamins and anti-oxidants, this solution with an amazing combination of natural oils and fruits restore the perfect balance of health and beauty within the skin.